“It’s my Undead Mage,” I said. Then, since he hasn’t spent most of the last ten years reading serially posted Harry Potter fanfiction* the way I have, I had to explain to him what a “plotbunny” was. * if you’re interested, I highly recommend the works of The Phantom Librarian. In the context of WoW, “plotbunnies” are the character concepts that make us want to roll a new alt to tell a story. I haven’t always been much for telling stories with my characters. I still don’t know very much about my Tauren, only that they are all, with the exception of Kregga, sisters, and that the two youngest are their parents’ “surprise” late-middle age children who, being vaguely unsatisfied with the current paths of the Earthmother, will find their callings in the new paths offered by the worshippers of An’She after the Cataclysm. I don’t really know very much about my Blood Elves either. They are also all related, either as sisters or as cousins, but I haven’t worked out the details of those relationships yet. I know that Kimona was happily married, that her husband died in the Battle of Silvermoon when Arthas came to defile the Sunwell, and that her daughter will take up her father’s sword as a Warrior when she comes of age after the Cataclysm. 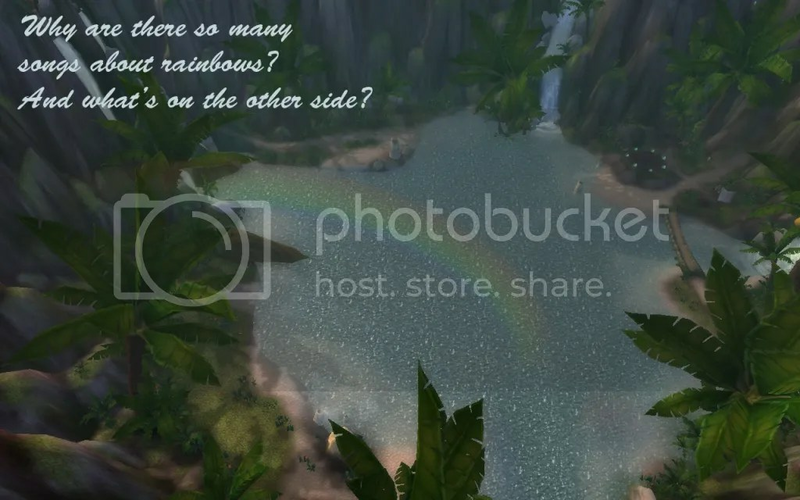 A year ago, when my only characters were four Tauren and six Blood Elves on Lightninghoof, I made up a story to explain how the Tauren and the Elves knew each other and why they were willing to share money and materials: Kamalia was running errands in Silvermoon City after doing her Shattered Sun dailies on the Isle of Quel’Danas when she met a Blood Elf Mage (Kaelinda) whose surname was the same as her own clan name. I still haven’t decided precisely what that family name is, but if you look at the family names of Blood Elf and Tauren NPCs on WoWwiki, you will find a surprising degree of overlap or similarity! Amused by this coincidence, the two developed a friendship which soon extended to the rest of their families and Kamalia contracted one of Kaelinda’s relatives to serve as her financial agent. Then Cataclysm was announced, and I moved all my Blood Elves over to Winterhoof to make way for names I wanted to save on Lightninghoof. Even though they can’t share materials and money anymore, I haven’t made up a story about a breaking of the ties between Kamalia’s house and Kaelinda’s because I still consider them friends who may interact with each other in future storytelling. But I didn’t really start thinking about histories for my characters until I rolled my first Death Knight. I thought, when Wrath of the Lich King first came out, that I could never play a Death Knight because I couldn’t stand to play an Evil character. I eventually became tempted by the idea of making a DK just to experience the DK starting area and to try out the class. It wasn’t until I came up with a story to explain the background of a DK, however, how she could become one in a way that wouldn’t make her Thoroughly Evil and Irredeemable, that I was able to roll one. My first Death Knight was Katelaira, and Katelyra the Hunter was originally created to represent Kat’s backstory — that will be a story for another post! When Cataclysm and the new classes for Tauren were announced, I decided that as much as I’d resisted the idea of having a Tauren DK — how could a Tauren ever choose to become a Death Knight?! — I really did want to have a Tauren of every class. It took me awhile to work out the story (in fact I’m still working out some bits of it), but when I had the basic gist of it down, I created Kregga Grimtotem. Most of my “level a character of each Race to 20” project characters don’t have stories. A few of them have begun to develop personalities, but I have even less sense of their histories than I do for my Tauren and Blood Elves. Kivrinne, though — she has a story she wants to tell, and she has had to be leveled somewhat past 20 for me to be able to tell it. Again, that will be another post for another day, because I still have work to do on certain elements of the story and how I want to present it. I love to play with the character creation screen and think about interesting appearances for characters to have — with or without an accompanying story. One such plotbunny arose from a name and appearance I wanted to use that only felt right for a Night Elf Druid. This character is sitting at Level 1 waiting for me to finish some other projects and level her to 20. I can’t decide whether I like the black NE kitty or the white NE kitty better, so she wants to be the mysterious wildwoman whose hair changes colour with the seasons: black between the Spring Equinox and the Autumn Equinox, and white from the Autumn Equinox to the Spring Equinox. Of course, some of the plotbunnies that inspire character creation “click” and some of them don’t. My first idea for a Draenei character went about like this: when she was born white-skinned and white-haired, her parents took it as a sign that she was destined to serve the Light and dedicated her to the Temple, where she grew up to be a Priestess. This idea never took flight on the one hand because I decided would rather play a Mage or a Shaman and on the other because I wanted to have a blue-skinned, white-haired Draenei more than an albino one. 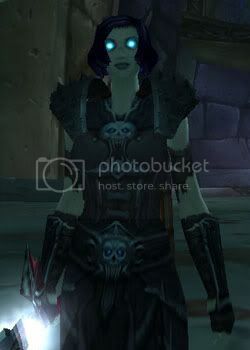 My third DK, rolled on Argent Dawn primarily to be the practical source of the RP “inheritance” that would fund my SAN characters’ level 20 mounts, was a Human female with that dark blue-black DK-exclusive haircolor named Kazuligosa. I wanted to rock the blue hair as a Blue Dragon who either turned to Arthas for more power to wield against the Black Dragonflight, or was raised at Sindragosa’s Fall and came up out of the ice in humanoid form instead of Frostwyrm form — to everyone’s surprise and dismay, especially her own! — whereupon the Cult of the Damned necromancers sent her off to Acherus because they didn’t know what else to do with her. But I couldn’t get the story to work out, because upon finding herself an assumed member of the Alliance, she would feel that her ends and motives had been thoroughly frustrated, she would rebel vigorously against participating in the Nexus War against her kin, and she would thus not get very far in Northrend at all. 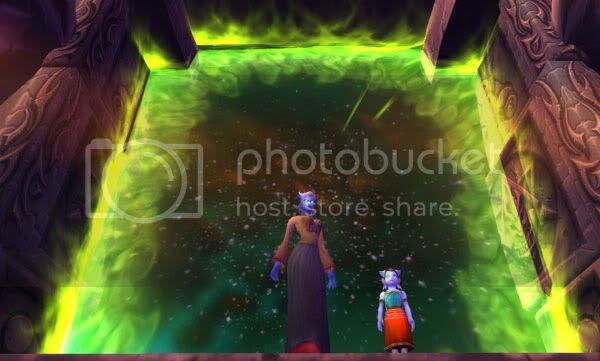 Presently I deleted Kazuligosa so that I could roll Draenei DK Kamaleya on Argent Dawn to do Outland Childrens’ Week stuff with Dornaa as proxy for Kamaliya. Since Childrens’ Week was her only purpose for existing and her contributions had already more than doubled my SAN characters’ fortunes, Kamaleya has also been deleted. And some characters feel like they should have a story, but they haven’t told it to you yet. Standing there on my character selection screen with her short black hair, dark skin, pierced nose and brow, and pleasant middle-aged face, my Human Mage, Khitka, looks like she should be a mother — but where are her children, and why is she out adventuring? What are some of your WoW plotbunnies? Things I want to accomplish in-game. Not quite a “preparing for Cataclysm” post, as some of these things might not be completed before the Cataclysm comes, and indeed, some are waiting on the Cataclysm to even be possible. As Kerisa is a Druid, I feel like she should have this title for RP reasons. She’s Exalted with the Cenarion Circle, but needs to spend some time in Outland questing and running Coilfang Reservoir for the Cenarion Expedition. I want to defeat Arthas on at least one character, and since Kerisa is my current raiding “main”, she’s got the best shot at it. forty Sunken Temple runs so far…. But first I’d have to get attuned, and then I’d have to convince BTH to run it with me. If I don’t manage this, I’ve already got the golden Mantle of Autumn from the Botanica to at least partially satisfy my desire for leafy druid shoulders. I’m currently at 4.5k gold, and I’d really like to be up to 6k gold before I actually buy epic flying so that I’ll have some left over to spend on repairs, etc. Yes, I know WoWwiki has maps of each zone, but I want to have my own portfolio of pre-Cataclysm maps. I’m trying to remember to take a screenshot of the map of each zone while I am there doing other screenshotting. * level a character of each Class at least to 20 — done! 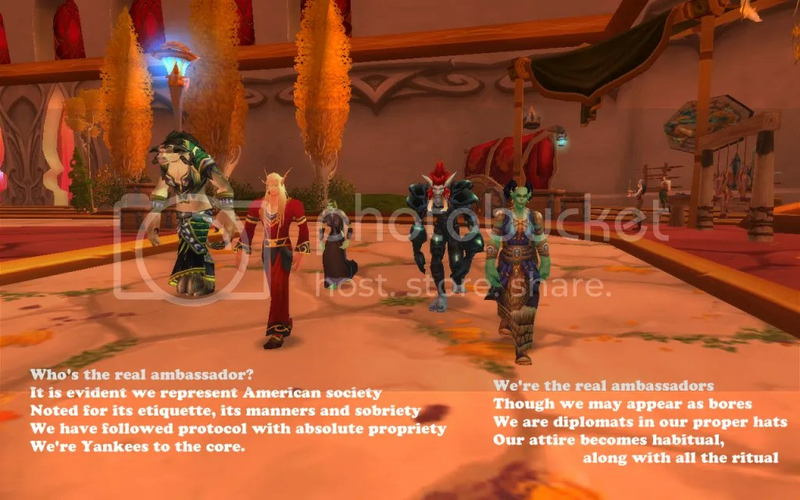 * complete “Loremaster” Alliance-side — ? Only Prof I don’t currently have on at least one toon is Jewelcrafting, but one of the toons I’ll be creating post-Cataclysm is slated to pick it up. When you have a whole bunch of alts, “which one will I play today?” can be a tricky question sometimes. Most of my list of “things I want to do before Cataclysm” (a post I will get around to making one of these days) revolves around the goals of my various characters. I have, on occasion, attempted to prioritize these objectives, but in the end, my choice of whom to play usually comes down to whichever character has been complaining the most stridently about not getting any playtime. Right about the time I signed up for the Eleventh Hour Challenge, Kaelinda had been pushing for some action. She’d been sulking about the loss of the ability to ever get a Swift Zhevra to ride, and since I’ve decided to get her a Celestial Steed when she gets to 60 (and when I’ve come up with a suitable RP quest line to explain why she has it), she was clamoring to get to 60 quickly. Then Desolace came out of the hat for me, and as I was looking at the quests and lore in the zone and thinking about my assigned Tribulation, Kay was the perfect character for me to do it with. She got another couple of levels out of the deal, and was therefore satisfied… for the time being. After last Thursday’s raid, Kerisa’s stack of Firecracker Salmon was running low, so I logged on with Kamalia to do some fishing and cooking. I was a little surprised to find Kamalia still in the outfit she’d been wearing for Children’s Week — had it really been a whole week since I’d played with her? Kamalia grumpily went out to Grizzly Hills to fish up some salmon for Kerisa, then declared that if all she was going to be doing these days was fishing, she wanted to go to the high altitude lakes of Terrokar Forest and work on fishing up Mr. Pinchy. Kamalia’s been sulking about being relegated to “primary alt” status. She’s envious of all the times Kerisa has gotten to toss Lifeblooms on Valithria Dreamwalker in between DPSing waves of adds, of all the times Kerisa has seen the Smouldering Bulwark drop off Marrowgar and Trauma drop off Rotface, of Kerisa getting to see Althor’s Abacus drop from Gunship, of all the Icecrown Citadel raiding that she wishes she were getting to see and do. So I took her off to Terrokar, but after a few pools, she got bored and flew out to Nagrand to beat up Warmaul ogres instead. A couple of evenings of this netted her enough kills and Obsidian Warbeads to get Exalted with the Mag’har — something she’s wanted for RP reasons for some time. 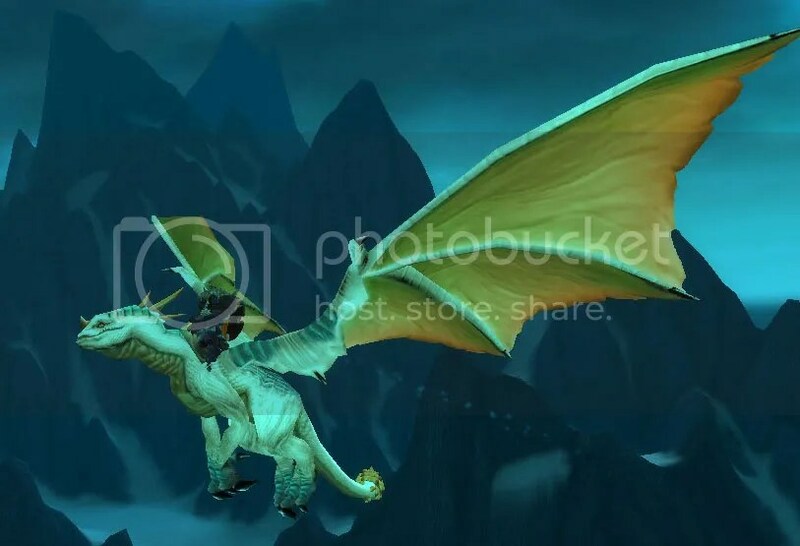 Being Exalted with one of the Nagrand factions also opens up the Talbuk mounts, allowing her to get her 50 mounts for the Albino Drake without having to buy more than two Skeletal Horses (one slow, one fast). It would have been significantly less expensive to have just bought all the Skeletal Horses, but she spent several minutes staring at them at the stables in Brill and just couldn’t bring herself to stomach owning any more than two.